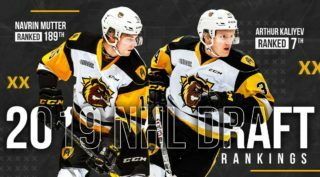 Nineteen-year-old defenceman Riley Coome stepped into a blast, picking the perfect time to score the first goal of his OHL career. Not only did Coome score the game winner with 1:58 remaining in a 4-2 London Knights win over visiting Kitchener, he did so in his 94th career regular season game. A native of nearby Dorchester, Ont., Coome was originally a free agent signing by the Knights prior to the 2016-17 season. The 6-foot-4, 210Ib London Jr. Knights Minor Midget grad has four points (1-3–4) through 27 games this season. 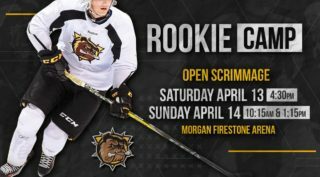 In a game where the two clubs combined for 15 goals, rookie defenceman Cameron Supryka took the opportunity to get involved. 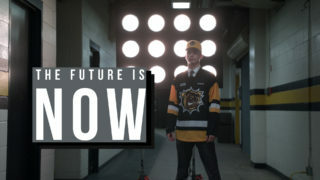 His Hamilton Bulldogs fell 8-7 to the visiting Erie Otters, but Supryka scored the first goal of his OHL career and chipped in with two assists for a career high three point afternoon. The 6-foot-2, 181Ib defender scored his first 3:52 into the second period spinning off his check before walking up the boards to snap a shot past Cole Ceci. He also picked up assists on goals by Isaac Nurse and Jan Jenik. The 17-year-old Belleville, Ont. native was Peterborough’s third round pick of the 2017 OHL Priority Selection from the Quinte Red Devils Minor Midgets. Supryka has six points (1-5–6) through 38 games this season. Guelph Storm rookie Zack Terry followed up on a second effort and picked up his first OHL goal as a result, helping the Guelph Storm take an 8-1 road win in Kingston. Terry’s goal came with 6:10 remaining in the second period as Cedric Ralph and Ty Collins picked up assists. The 16-year-old Oakville, Ont. 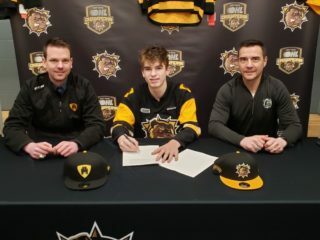 native found the back of the net in the 36th game of his rookie campaign after he was a second round pick by the Storm from the Oakville Rangers Minor Midgets last spring.